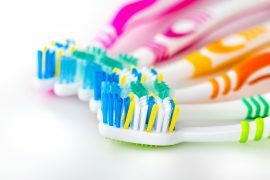 Create individualized oral hygiene box including: toothbrush, toothpaste, cup, mouthwash, oral swab, etc. As a result of the program, our residents have gained an improved quality of life and decreased caregiver dependence. We have increased CNA productivity due to residents requiring less assistance, while also decreasing hospitalizations due to medical complications associated with poor oral care. In addition, we have seen increased interdisciplinary team communication. The oral hygiene program has benefited residents, caregivers, therapy and the facility. Not only have we boosted awareness of the importance of providing good oral care, but we have also enhanced residents’ self-efficacy.